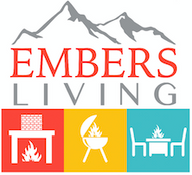 For an alternative to traditional gas fireplaces or inserts, Embers Living offers direct vent gas stoves that are more efficient and will operate without electricity, offering timeless beauty that will be sure to provide that "WOW" factor in any home. Our gas stoves are available in several different colors and configurations for any budget so that you can match the decor of your home. Our Napoleon stoves give you the option to choose fuel type, stove color, decorative panels, blowers, and controls. Our Vermont stoves let you choose color, fan kit, and warming shelves. Check out our options and find your favorite, today!